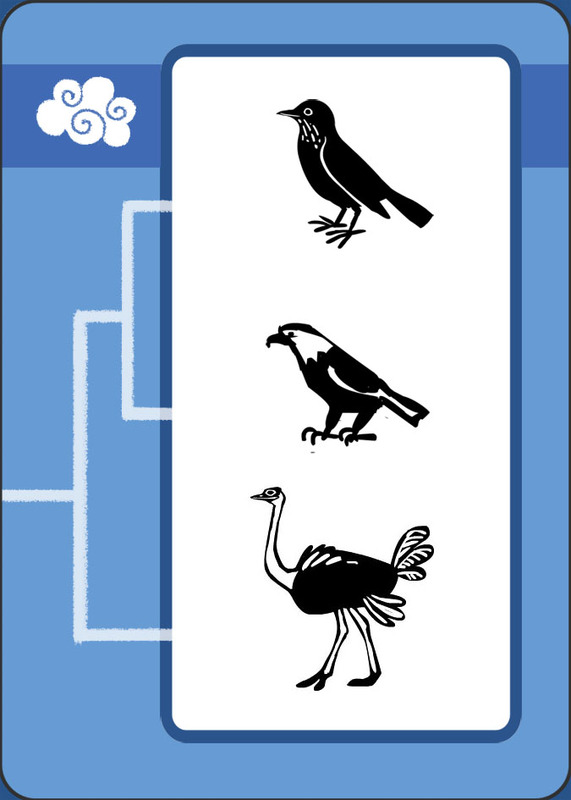 After Grandmother Fish, Karen and I raised money for Clades, an animal-matching game based on evolutionary relationships. We raised enough money to create a second version of the game, Clades Prehistoric, with all prehistoric species. We have shipped the games to Kickstarter backers, and now they’re available to the general public. Here’s a link to the Kickstarter video, which explains the game and the thinking behind it. What is a clade? 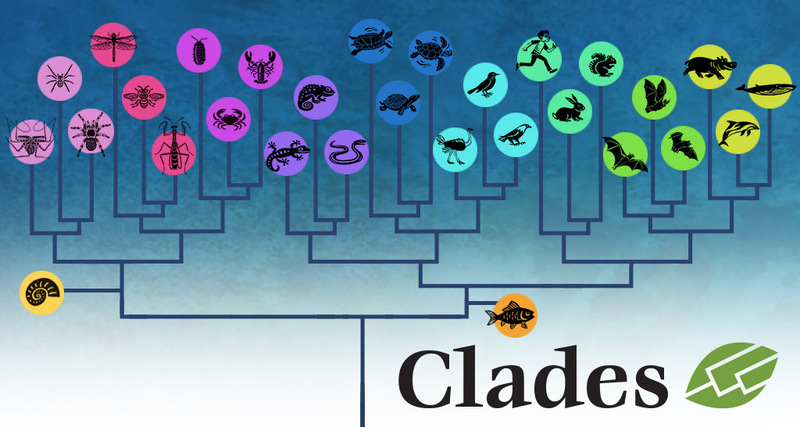 In biology, a “clade” is a complete branch of the evolutionary family tree. It defines categories of living things by their evolutionary history. This powerful concept has revolutionized the way scientists classify living things, and our new game makes it easy and fun. Playing Clades: The Clades game consists of 83 cards. Each card has one, two, or three types of animals illustrated on it. 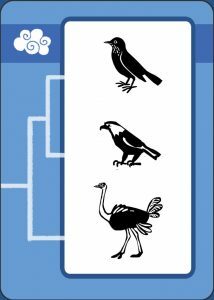 On any given card, the animals are all from one of three major clades: mammals, reptiles (including birds), or arthropods (insects, crustaceans, and arachnids). Players try to be the first to spot a match of three cards among 12 cards played face-up on the table. Each player also has a secret card that only they can use to make a match. If you spot a match, you collect those three cards, and whoever has the most cards at the end is the winner. If the match is a “clade” match, such as “all mammals”, gives you extra cards. The special Mollusk and Ray-Finned Fish cards also earn you bonus cards. During play, you never wait for someone else to take their turn, and you never get eliminated from the game. You can even play solitaire. It’s for ages 6 to adult, and the instructions include several ways to balance the game when some players are more skilled than others. Karen’s cute art: Every card features Karen’s spirited, detailed animal drawings. The animals are arranged on the card according to their evolutionary history. In the case of birds, for example, robins and eagles are more closely related to each other than they are to ostriches. 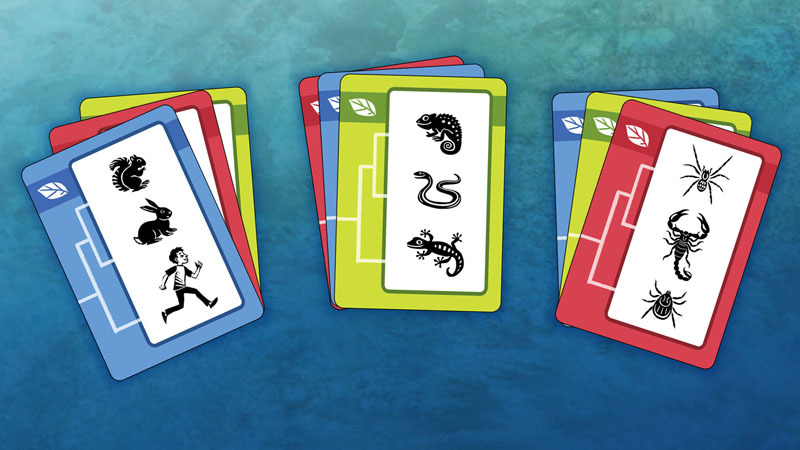 Clades Prehistoric: This version of the game uses all prehistoric animals. Dinosaurs! Pterosaurs! Marine reptiles! You can even combine cards from both decks to play a combination game. After the Clades Kickstarter, we made a deal with Atlas Games, a publisher of great tabletop games. They have published Clades and Clades Prehistoric, and they’ll be able to get it into more stores than Karen and I could on our own. Karen and I are once again honored and encouraged to find people who support our vision of fun-loving evolution science for kids. Thank you for your interest in Clades. Here are the backers who made Clades and Clades Prehistoric possible.